Whether it’s breakfast time or happy hour, there’s something about sitting at counter or bar height that makes an everyday event just more fun. Let your legs dangle and find the perfect bar or counter stools for your space. Counter height tables and kitchen islands are typically 36 inches high, making them a great food prep station or work surface when standing. And at 24 inches high, counter stools work as the perfect seat companion. Bar stools are typically five to six inches taller than counter stools, making them ideal for a traditional bar counter, which typically fall between 40 and 42 inches high. 36-inch high counter table or kitchen island + 24-inch counter stool = perfect counter solution. 42-inch high bar table + 36-inch high bar stool = perfect bar solution. Don’t worry. 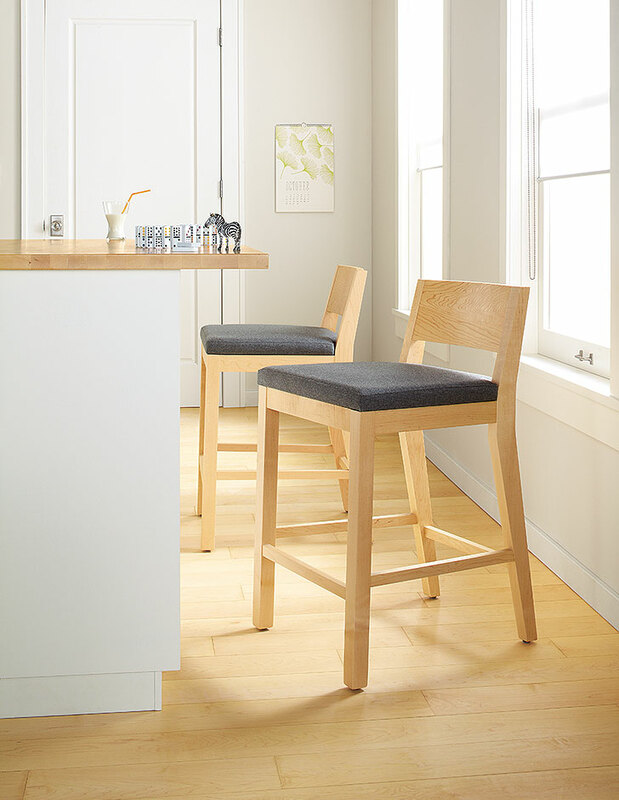 We’ve made it easy to shop for counter & bar stools on roomandboard.com. 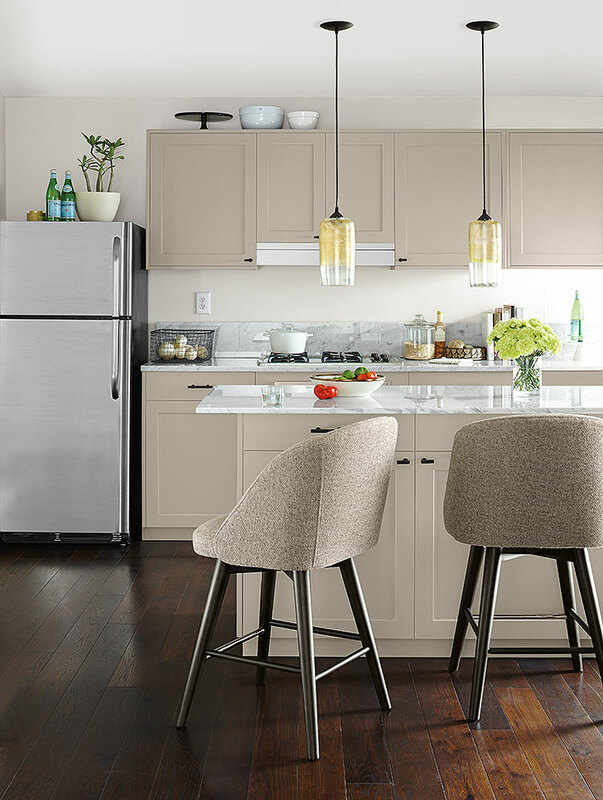 And once you’ve narrowed down counter vs. bar stool, you get to the fun part: Exploring style options and the type of functionality that works for your space. Leather? Fabric? Wood? The material you choose for your counter or bar stools reflects your personality and can complement the surrounding space with like-colors, or act as a beautiful contrast. Our Hirsch stools are available at counter or bar height and offer tons of sleek, modern style. 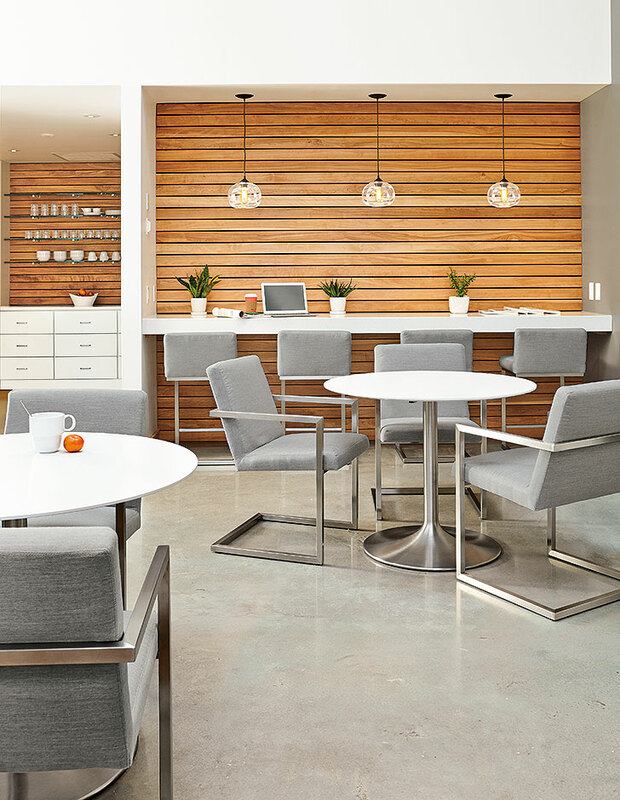 We love how the sleek look of our Hirsch stools keeps this dining space modern. The white bonded leather pulls the lightness from the rug across the room, and acts as a unique contrast to the dark island and counter top. A contemporary twist on the traditional stool, Lira is scaled for easy livability and features a frame that gently flexes as you move. 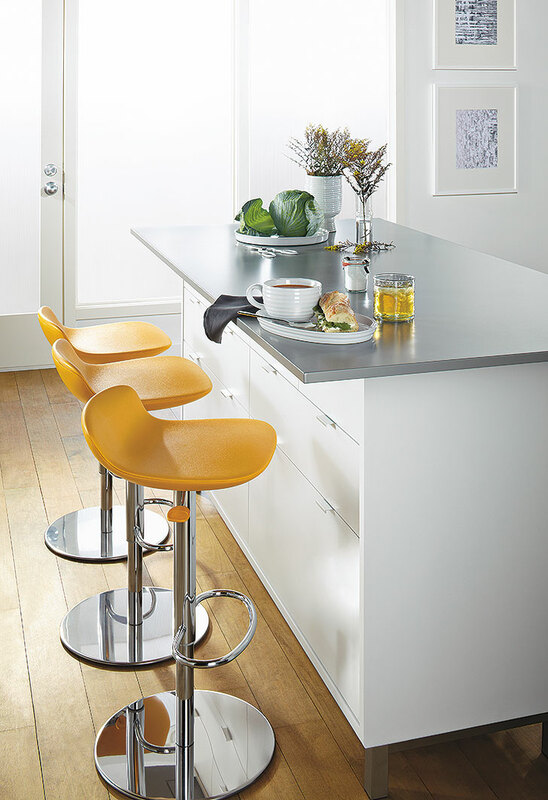 Lira bar and counter stools beautifully blend a stainless steel base with an upholstered seat. A mix of materials is a great solution if you’re looking to balance out your dining space. Here, the cool tones of Lira complement the warmness of the wood and the white counters. A Room & Board classic, our Afton stools are super versatile and highlight the beauty of natural wood plus the comfort of a fabric or leather seat. If you’re looking for a counter or bar stool that transcends trends, opting for natural wood will always look in style. Our Afton stools are super versatile and highlight the beauty of wood and timeless design. For a streamlined look, we paired Afton in maple with a maple counter top. Keep features like swivel bases, armrests, seat backs and height adjustability in the back of your mind to help solve your “highchair” needs. 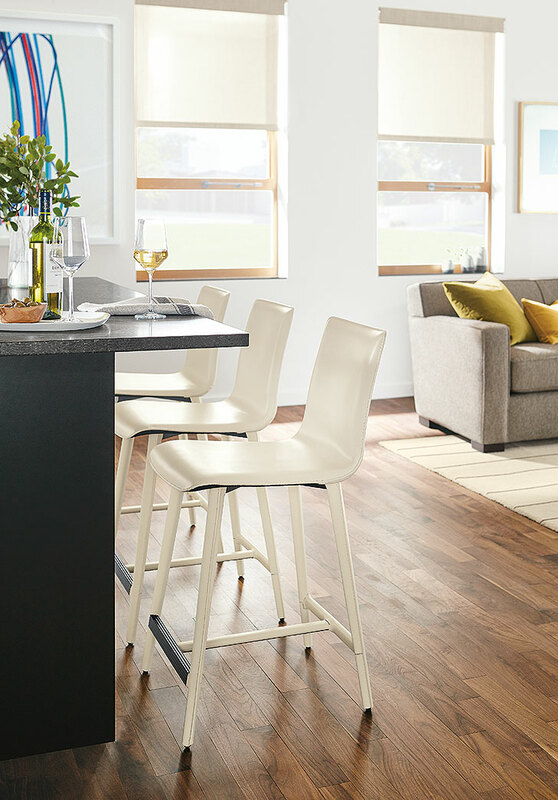 Our Leo swivel stool is suitable for counters or bars, as you can easily adjust the height. A great option for kids or any bar or counter that gets plenty of use, the Leo stool is packed with style and function. A polyethylene seat holds up to wear and tear, while a chrome base will always look sleek and modern. Height adjustability means Leo will work no matter the height of the counter or bar. Get comfortable at the counter. Our Cora swivel counter stools feature a soft, wraparound back and welted seams. Our Cora counter stools also have swivel functionality – a big hit with kids or kids at heart – so you get the best of both style and function. If the majority of your meals take place at the counter or if you want guests to be comfortable throughout the evening, fabric stools or leather stools maximize comfort. Shop all modern counter and bar stools at roomandboard.com.